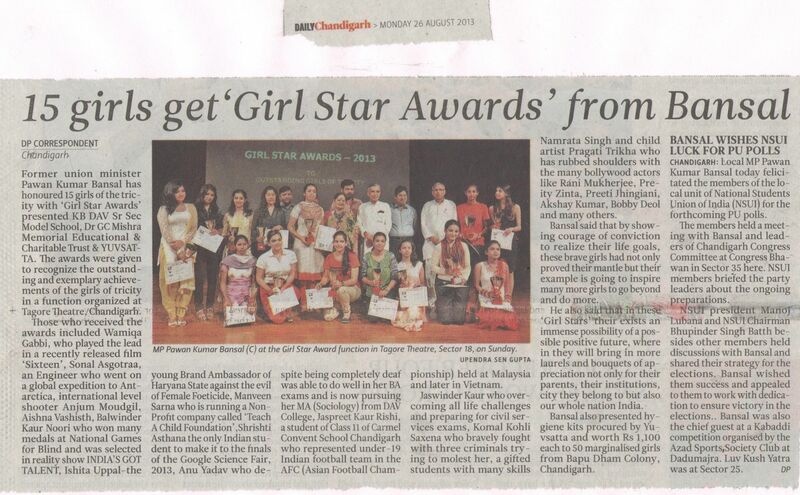 This past Sunday, 15 girls were awarded with the ‘Girl Star Awards’ in recognition to their outstanding work and achievements on the different areas of social, scientific, and cultural interest. The awards, were jointly organized by NGO Yuvsatta, KB DAV Senior Secondary Model School, Dr GC Mishra Memorial Educational and Charitable Trust for the first time, and presented by former Union Cabinet minister Pawan Kumar Bansal. Among the awardees were young actress Wamiqa Gabbi, international-level shooter Anjum Moudgil, Class XI student and football player Jaspreet Kaur Rishi, Class XI student and Google Science 2013 fair finalist Shristi Asthana, extremely multi-talented Aishna Vashisth, athlete Balwinder Kaur Noori, Haryana brand ambassador against female foeticide Ishita Uppal, non-profit entrepreneur Manveen Sarna, high achievers Anu Yadav, Jaswinder Kaur, Namrata Singh, brave Komal Kohli Saxena, artist Pragati Trikha, and engineer researcher Sonal Asgotraa. The Asian Girl Campaign expresses its most heartfelt congratulations to these inspiring young role models. Go girls!